A lot of houses in Fairbanks are built on permafrost, and there are techniques for building on that kind of ground that have been used for decades. But depending on the type of permafrost, there are unknowns about what will happen — even to those houses that have been built using best practices — as the permafrost thaws due to climate change. For one homeowner, that concern is front and center as he builds a house on what he calls some of the worst ground in Fairbanks. Ilya Benesch is a do-it-yourself kind of guy. He’s worked in construction for close to 30 years. 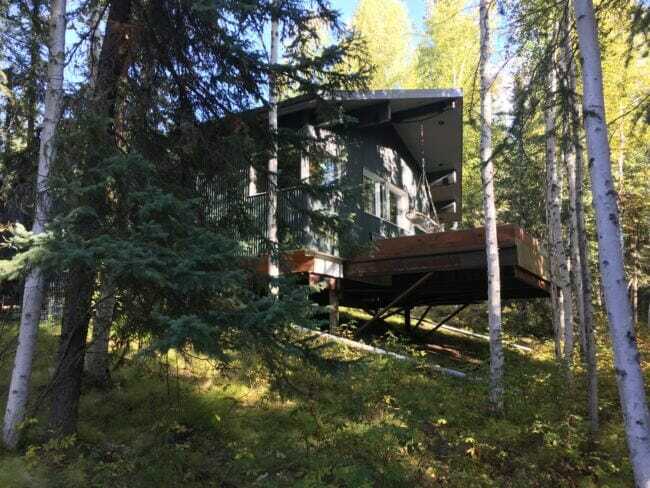 And for the past 10, he’s been working on two large cabins — one to live in, one to rent — at the edge of a gully dotted with birch and black spruce trees. When Benesch bought this property back in 1999, he was pretty sure it had permafrost under it, though he didn’t know for certain. But he wasn’t intimidated by the idea of building on permafrost; as a carpenter he’d already had some experience with it. And the reasons to buy the land were compelling: it was spacious, relatively cheap and only a few minutes from his parents’ house. “As I saw my parents aging, I saw a lot of value to being close by, and what was affordable in 1999 was north side of the hill property,” Benesch said. A commonly-cited rule of thumb in Fairbanks is that if a property is on a north-facing slope, it’s more likely to have permafrost under it. The permafrost in the Interior is what’s called “discontinuous”: it can stretch hundreds of feet below the surface in some places and be totally nonexistent in others. There are a number of factors that determine whether there’s permafrost below: soil type, vegetation cover, elevation and sun exposure to name a few. Benesch started building in 2008. And a few years in he decided to get the soil drilled to get a sense of exactly what the permafrost looked like under the surface. The news he got was bad. “This shallow, warm, ice-rich permafrost with massive ice formations is one of the most difficult environments on which to construct a stable foundation,” Benesch said, reading from the drill report he got back. Basically, Benesch’s house is built on permafrost that’s relatively close to the thawing point — which is common for Fairbanks — and is full of ice that will turn to water when it thaws. That could dramatically transform the land under his house, though he’s still not sure exactly what that would look like, especially since he’s on a hill. But Benesch is perhaps one of the best people in Fairbanks to be in this position. For the past decade, he’s worked as a building educator at the Cold Climate Housing Research Center. That’s a Fairbanks-based nonprofit that researches building strategies for Arctic environments and provides public education. Benesch talks to homeowners and contractors about exactly this kind of stuff: how do you build the best house you can on permafrost that’s expected to thaw? Benesch walks under the porch of the first cabin, and points to the foundation — one of the important design choices for building on permafrost. His consists of pilings made of steel pipe, 6 inches in diameter. Building on pilings is a common approach for constructing on permafrost; they anchor the house and loft it up so it doesn’t warm the ground underneath. When Benesch started building, he knew that 40 feet was the typical depth for pilings, so he went with that. “What I know now is that I probably should have driven to 60 feet,” Benesch said. That’s really deep. He’s since retrofitted two additional 60-foot pilings that will be able to support the house if the others fail. Aside from the foundation, Benesch has given a lot of thought to how to protect the ground and keep the permafrost cold. He’ll have a large wraparound porch to keep the foundation shaded, and a continuous gutter around the roof that empties 25 feet into the gully to prevent any erosion or water from getting in the pilings. Benesch is also doing his best to not disturb the moss and trees around the house, which provide shade and insulation for the ground. He’s even adding to them. 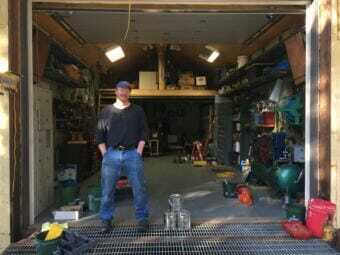 “I’ve actually planted Siberian larches; there’s about 22 of them right now,” Benesch said, pointing at the seedlings scattered around the house. All these measures are standard for people who are building on permafrost and want to make sure the house itself doesn’t cause the permafrost to thaw. But they’re also just the simplest and most affordable tools in the toolbox when it comes to stalling thaw due to rising temperatures. Benesch knows that they won’t stop it in the long run. But he hopes they’ll be enough, at least for his lifetime… and even beyond it. He’s 49 now. “I’m not afraid of a challenge, but the not knowing what this area’s going to do in 10, 20, 30, 40 years, it makes me uneasy,” Benesch said. If Benesch had the chance to go back to 1999 and buy a different piece of property would he? Yeah, he says, he would. It would save him a lot of time and some sleepless nights. But Benesch says that for anyone determined to build on permafrost themselves he has a few suggestions: build small, get educated on best practices and make sure to get the drill testing done before you start.